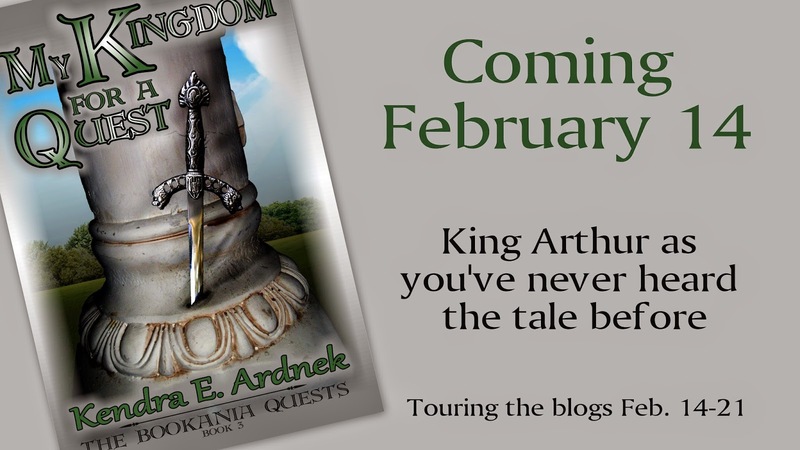 On Saturday, Kendra E. Ardnek released her latest story in the Bookania Quests, titled My Kingdom for a Quest. This week, I’m helping out with the blog tour promoting this book. Tomorrow we’ll have the main character of the book over for an interview, but today I wanted to share my review of the first book in the series, Sew, it’s a Quest. I had been reading Kendra’s blog for a while, and was intrigued by her writing style and love of fairy tales, but I hadn’t managed to get my hands on any of her books. Imagine my joy when I received a copy of Sew, it’s a Quest for Christmas! I took it with me on vacation and absolutely blitzed through the story. If you like fairy tales, I definitely recommend this book. I went straight out and bought the sequel, and cannot wait to read it! Ooh, yes, My Kingdom For a Quest released finally! I just got my copy. ^_^ I’m in the midst of reading Sew It’s a Quest and enjoying it — and I can’t wait to get to the Arthurian stuff! I loved the first book! I am going to read the second this spring, and I can’t wait to get My Kingdom for a Quest. I have a feeling it is going to be my favourite out of the series so far. Aw, that sounds like such a sweet, funny story. What a delightful premise, too! It almost made me chuckle, to think of a switching of gifts where the boy likes to sew tapestries. Lovely review too, Jenelle; I will definitely check out Kendra’s books :).